This article is about the spring Cup Series race at Richmond. For the fall race between 1976 and 1980, see Federated Auto Parts 400. The Toyota Owners 400 is a 400 lap Monster Energy NASCAR Cup Series stock car race held at the Richmond Raceway in Richmond, Virginia. From 2007 to 2011, former race title sponsor Crown Royal named the race after the winner of an essay contest during Daytona Speedweeks. The winner of the first essay contest was Jim Stewart from Houma, Louisiana, with subsequent contests won by Dan Lowry of Columbiana, Ohio and Russ Friedman of Huntington, New York, with the 2010 race being named for Army veteran Heath Calhoun of Clarksville, Tennessee. Since 2010 only military service members have been eligible to win the contest. Crown Royal moved the "Your Name Here" sponsorship to the Brickyard 400 beginning in 2012. 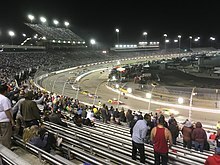 The race is currently held as a Saturday night event in late April. For several years, it was held as a Sunday afternoon event the weekend after the Daytona 500 in February. Lights were installed at the facility in 1991, but the spring race remained during the day. Consistent cold weather, and even a snow delay in 1989, prompted track officials to move the race later in the spring. The race was moved around to May or June, and permanently moved from Sunday afternoons to Saturday nights. After a few years, the race eventually fixed as a May race date by 1999. Starting in 2012, the race was held on the last Saturday in April, after the race switched dates with the spring Talladega race. The race returned to Sunday afternoon in 2016 but returned to Saturday night in 2018. Martin Truex Jr. is the defending winner of the race. 1962: Race shortened due to darkness. 1974: Race shortened due to energy crisis. 1977, 1982, and 2003: Race shortened due to rain. 1986: This race is largely remembered for its controversy. Dale Earnhardt spun out Darrell Waltrip at the end, and both cars crashed. Petty slipped by to win. 1988: Last race on old layout. 1989: Race rescheduled one month later due to snow. 1998: Race moved to Saturday night event. 2002: Race started on Saturday night but was finished on Sunday afternoon due to rain. 2007 and 2015: Race postponed from Saturday night to Sunday afternoon due to rain. 2008, 2013, and 2018: Race extended due to a NASCAR Overtime finish. 2009: Kyle Busch won on his 24th birthday. As of 2016, the Toyota Owners 400 is broadcast on Fox in the United States. During the 1980s and early 1990s, TBS covered the race. ESPN took over later in the decade, and from 2001 to 2006, the race was shown on FX. In 2007, for the first time in the track's history, the track's races aired on network television. In 2007, for the first time in the track's history, the track's races aired on network television. ^ "Fan crowned the winner of 'Your Name Here' contest for Richmond race". February 28, 2008. Retrieved February 29, 2008. ^ "Crown Royal Honors America's Bravest for 2nd Year With Naming Rights to NASCAR Sprint Cup Series Race". October 28, 2010. Retrieved April 30, 2011.